USB or Lightning, great for podcasting. The AT2020USBi is a high-quality condenser microphone with a wide diaphragm that plugs directly into your computer or the device of your choice: PC, Mac or lightning equipped iOS device. The A/D converter is built right into the microphone so all you have to do for professional quality, broadcast-ready sound is plug the USB or Lightning output (both cables are included) into your computer. 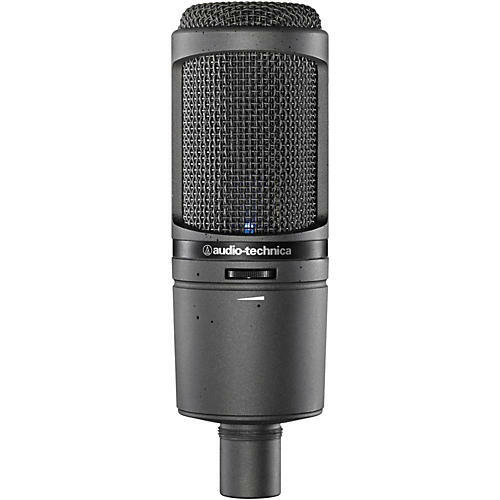 Combining high-resolution audio with increased connectivity options, the AT2020USBi cardioid condenser microphone adds a new level of sound-quality and convenience to Audio-Technica' USB microphone line. Modeled after the critically acclaimed AT2020, this digital output mic features an A/D converter with a 24-bit/96 kHz sampling rate to deliver high-resolution articulation and intelligibility that' perfect for home studio recording, field recording, podcasting and voiceover use. Comes with tripod desk stand, Lightning and USB cables, a pouch and a metal clip. Order today and improve your broadcast sound.